High filtration outer bag system with HEPA-type paper bag traps 99.9% of dust and pollens as small as 1 micron, leaving only clean air behind. 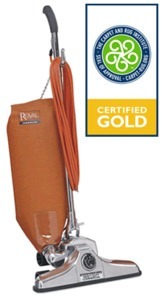 Dust bags are also available in Standard, Royal-Aire® and HEPA material. I absolutely love this vacuum. So glad I found this on your website.